Apparently Kim Kardashian wasn't just playing a cruel practical joke when she tweeted that Yeezy would bring back GOOD Friday on the morning on Jan. 8. One week after dropping "Facts," Kanye West released "Real Friends" featuring Ty Dolla $ign and a snippet of "No More Parties" featuring Kendrick Lamar. TYIF! (Thank Yeezus It's Friday!) "Facts" was hard and threw shade left and right, in the direction of (including but not limited to) Drake, Steve Harvey, and Bill Cosby. "Real Friends," though, is more emotional. 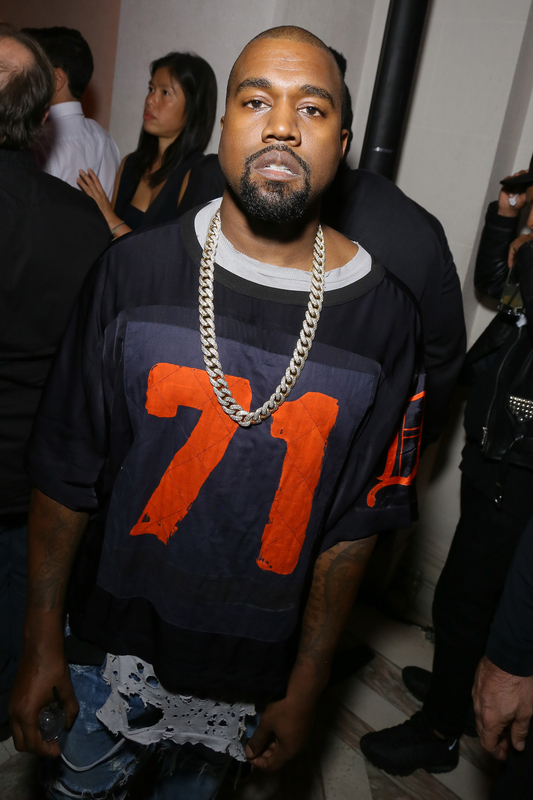 The track is about Kanye's relationships with his friends and family in the past and present, lamenting how often those relationships are based on false pretenses. But who exactly is "Real Friends" about? Kanye first put up "Real Friends/No More Parties" on SoundCloud, then took down because he wasn't satisfied with the sound quality, but then put back up again. He is a perfectionist, after all. Though "Facts" was funny, angry, and incisive, "Real Friends" is more emotional and complicated. And though "Facts" was extremely blatant in just who it was calling out, "Real Friends" doesn't mention anyone by name — neither friends nor family, though the trust issues that Yeezy is talking about seem like they are directed at specific people in his life. If this is a real anecdote about Kanye's family life, I applaud him for being brave enough to relive that horrible moment to write about it in a song. And as the title suggests, Kanye questions the idea not only family but of "real friends," in such a cynical tone in the song that it seems like he doesn't even believe in the idea at all. Above all, Kanye sings bitterly about friends that have treated him like crap in the past, but the bigger an icon he becomes, the more he is used by those around him. It starts, "Real friends, how many of us? How many of us, how many jealous?" But Kanye doesn't say who exactly he's talking about. 'Ye has had a few infamous feuds, but it's safe to say that "Real Friends" isn't about Taylor Swift or Beck. Kanye is fed up by people asking him for favors, and it really comes through on "Real Friends." Again, though, the song doesn't name anyone, although I'm sure the people it's directed to know exactly who they are. Maybe that's the point. But Kanye also talks about what makes him drift from those people; that his life and family are changing, and he can't keep up with the details of other peoples' lives: "Couldn't tell you how old your son is, I got my own Jr. on the way dawg, plus I already got one kid." Kanye has changed a lot over the years, but a few things have remained the same: the thing he hates most about fame is the haters and even worse the transparent friends that just want to take and not give. Yeezy also has always been a family man, like with his track "Only One" that he released in 2015 (that will also be on his upcoming album Swish). He sang powerfully about all the women in his life: his late mother Donda West, his wife Kim Kardashian, and his daughter North. So some of those not so "real friends" he's rapping about now are probably the ones who apparently dumped him after he started dating Kim Kardashian. [As] soon as we started dating, fashion people were really opposed to the idea of reality stars. And all the relationships, the somewhat friends that I had somewhat built up, completely turned their backs on her and me ... already had their back to her, and now they turned it to me. Even though we might not know who "Real Friends" is about, I think those not so real friends know it's them that Yeezy is mad about. If the rest of the songs from GOOD Friday are as solid as "Real Friends/No More Parties" and "Facts," Swish is going to be an amazing, intensely personal album. But it might make him more enemies: that's what comes with being Yeezus, and Kanye knows that.